Discussion in 'Effects, Pedals, Strings & Things' started by freddy_von, May 2, 2016. Ive been on a bit of a Fuzz Face quest for a little while now. Have played a lot of different versions, germanium and silicon and numerous different transistor setups of both. 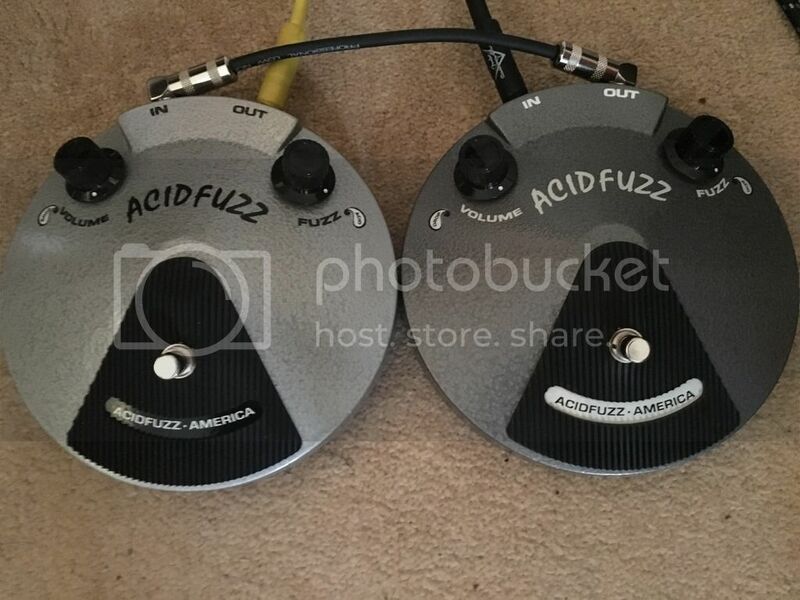 Recently I was lucky enough to score an Acid Fuzz Fuzz Face. NKT275 Red Dot transistors, which happen to be my favourite in a Fuzz Face, and all NOS components inside, not to mention it looks absolutely amazing. It arrived, I plugged it in, I was happy but not blown away. Opened it up to have a play with the bias trimmer inside. One tiny little turn and there it was...germanium Fuzz Face bliss. That thick, woolly, blown out fuzz tone that only a great Fuzz Face seems to be able to give. Since then, I've been content with this Fuzz Face. No need to continue hunting. But then the fine folk at Acid Fuzz recently decided to build up another of their NKT275 goodness. Yep, if I'm going to get another Fuzz Face, it might as well be the twin of my favourite. So, I got lucky and scored the darker grey Fuzz Face. After waiting for it to arrive from overseas, it finally landed. I was a little apprehensive when plugging in the new one as the bias adjustment wouldn't be possible on this one, as there's no internal trimmer. Well, I plugged it in and back to backed it with my other and there it was...that exact same tone that I get from the other. Do I need two?...absolutely not. Do I want two?...hell yes. chiller_instinct, EL34, PlexiFuzz and 7 others like this. Sweet. i would like to try one of those. Nice snag! If I were to ever go the FF route a NKT275 base would without a doubt be my go to. ScienceFriction and freddy_von like this. Yeah, I've always found that the NKT275 has been my pick of the bunch. From my understanding though, the stocks are starting to dry up and builders are having difficulty getting their hands on them. That right there is my Fuzz Face grail. I'm loving mine too along with my Sonus '66 replica. I'm kinda glad I got mine direct from Jon when I did, his listings are skyrocketing on eBay. Yeah two is just too much for one person. I'll take one off your hands, free of charge...it's a win-win situation. I'm sure they sound sweet as can be. How does the Sonus stack up? I've been keen to try one of those for a while too. I like the Sonus just a bit more. I'd say it sounds more vintage correct to me, probably because the Acid has a hair more gain. The Sonus doesn't have a bias trimmer though so that might be a turn off to some people. Mine sounds great as it is though. Again, this is just comparing the two FF's I have, there can be slight variances comparing others. Looks like Patrizio raised his prices too, $100 more now. I just picked up a Sonus 1966 FF, I'm stoked!